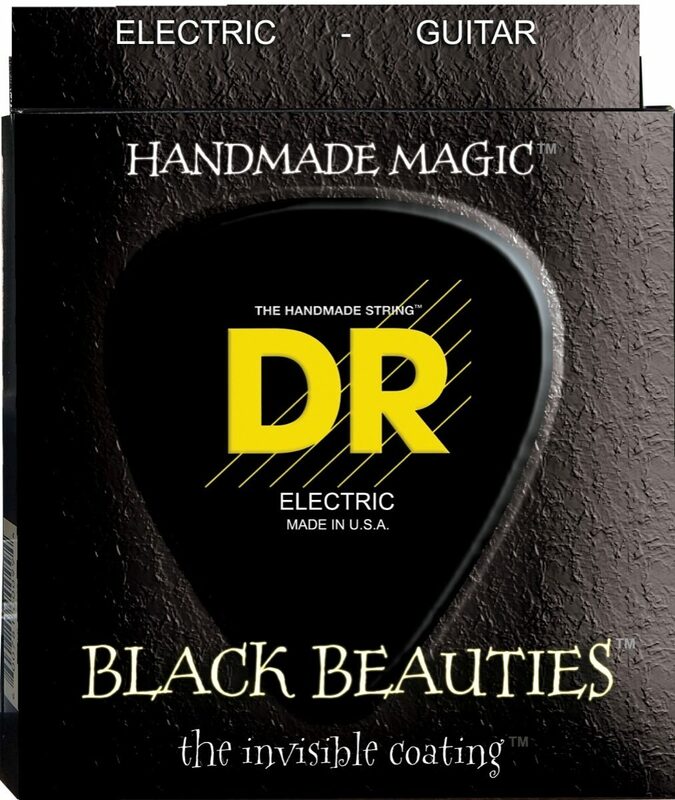 "DR Strings' Black Beauties black coated electric guitar strings represent the latest in coated guitar string technology! DR's K3 Technology coated wire is pre coated before winding for extra life and extra protection. All six strings are protected for improved performance and corrosion resistance. 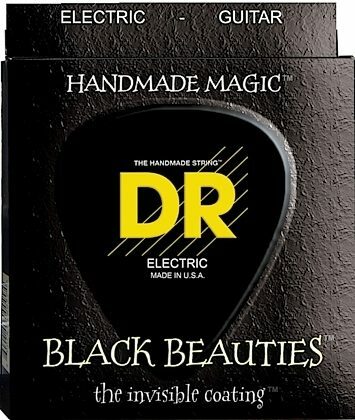 DR's Black Beauties strings offer players a superior coated string without sacrificing the crisp tone, clarity, and volume of traditional strings. The K3(TM) Coating is the first coating that players report, "sounds as good or better than uncoated strings." DR's new, remarkable, proprietary and patented #8487168 K3(TM) Technology Coating is the first coating that makes no apologies and no excuses for not delivering sound equal to uncoated strings. Players tell us these strings have more volume, less unwanted overtones, greater clarity and articulation then standard, uncoated strings. Yet, they provide the same protection. zZounds is an authorized dealer of DR Strings products. Sound: Great strings. I buy like 10 sets at a tome of the 11-50s, I play Eb half step detuned. I dig them and the looks. I actually find these strings last so long I tend to change them out after a couple months as I never wear them down or the coating. Sometimes you get a little pick wear on the 1st string but that does not effect the tone. Feature: Certainly one of the best coated strings. Ease of Use: I use Spertzel locking tuners on all by guitars and Eb tuning. No breakage issue or intonation problems, they remain in tune quite well. Quality: I have had some regular DRs in the past I was not that taken with. These Black Beauties are just great strings. If you do not want the coolness and darkness of the blacks, I think they have a clear set as well. Coated strings are the way to go. These look really cool on my ebony neck guitars as well as my maple fingerboards. Value: I think the price I find them for is often better than what I used to use, music stores never have them so I always load up on line. Manufacturer Support: No idea. The Wow Factor: Black strings are just wicked cool. I love the odd looks when people see them. Overall: For now these are my strings of choice in the 11-50s and I am utterly sold on coated strings. They last so long I usually change them just from all the stretching I put them through in a few months time. Word of advice, these dark strings are hard to see, sometimes damn near impossible. If you have to stare at the neck quite a bit to hit your spots they might pose an issue for you. I seem to have little problems unless the room is really dark which would effect even normal strings. 3 of 3 people (100%) found this review helpful. Did you? This review has been selected by our experts as particularly helpful. "Great looking and sounding strings!" Sound: Sound from my Gibson SG with these strings are crunchy and sustain is better with these then any others I've tried! A+ Feature: Features a coating that let's you feel the strings and become part of my fingers! Slides and bends are improved! A+ Ease of Use: Easy playing strings! Love the feel! A+ Quality: Great quality! String coating wear the pick hits but I play with a thick 1.5 mm and hit the strings very aggressively! Still sounds great! A+ Value: Wish they could give them away! Unfortunately, they need to stay in business! Compared to other coated strings real value! A+ Manufacturer Support: Never needed to reach out! So that's a win in my book! A+ The Wow Factor: They are a beautiful string! A+ Overall: Bought these with my expectations not very high! Wow they bring the look, feel and sound I was looking for! I might never try different kind of strings again! Style of Music: Heavy, rock, blues!